Intel Report on the 38cm. R Sprgr. 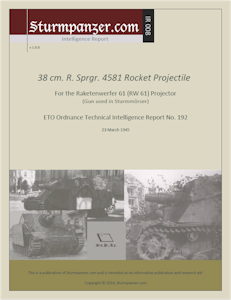 4581 Rocket Projectile for the Raketenwerfer 61 (RW 61) Projector, with 2 photos and 1 diagram. "The 38 cm R. Sprgr. 4581 rocket projectile is fired from the new type rocket projector Raketenwerfer 61 (RW 61) mounted on a Tiger I chassis. Information on this projector is contained in ETO Ord. Tech. Intell. Report No. 184."